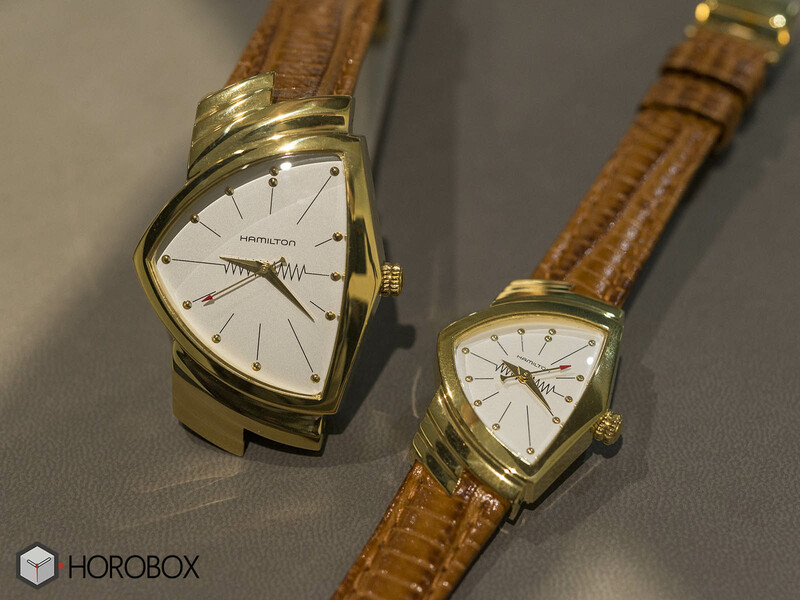 Hamilton Ventura, the world’s first electric wristwatch with a battery, celebrates its 60th anniversary this year. The new Ventura collection, which is widely inspired by the first model introduced in 1957, consists of 3 different models. The Hamilton Ventura model's unusual chassis design makes it a bit difficult to talk about its dimensions. The model, which comes in two different case sizes, appeals to both male and female users. Sapphire crystal glass is on the front of the watch, which is made of stainless steel with yellow gold PVD coating. The horns with a width of 17mm offer a quite different design from a conventional watch. The new models come with a waterproof rating of 50 meters. It is a bit hard to talk about the size of the Ventura models due to their unusual case design. The new model comes in two case options as men’s and ladies’ versions. The yellow gold PVD coated stainless steel case sports a scratch resistant sapphire crystal on the front side. 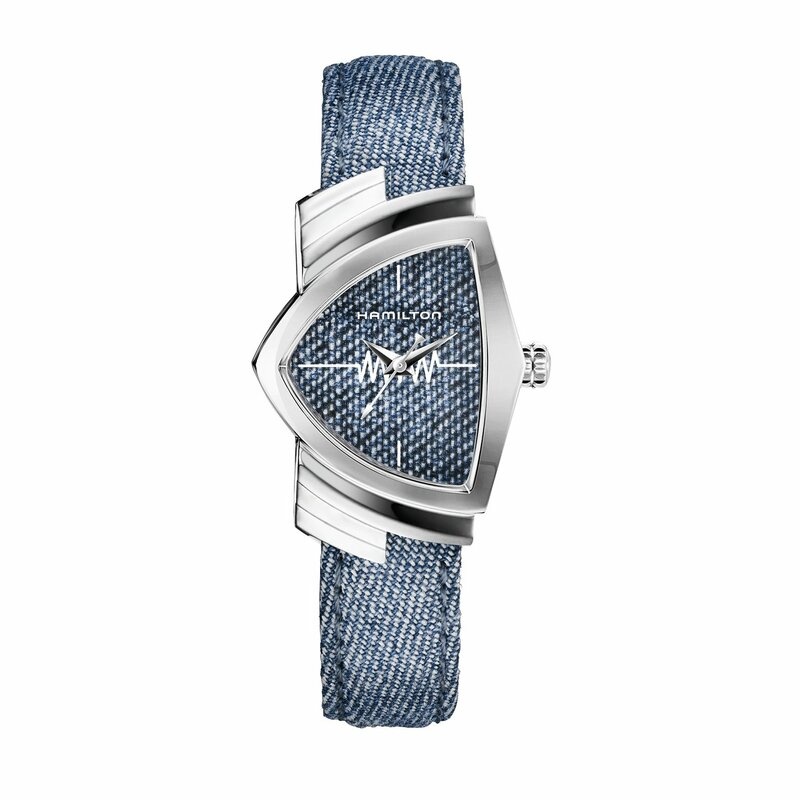 The new Ventura collection also features a version with a denim dial and a denim strap. This version also comes in two case sizes as in the previous model. The size of the ladies model is 24mm x 36.5mm and the men’s model is 32.3mm x 50.3mm. 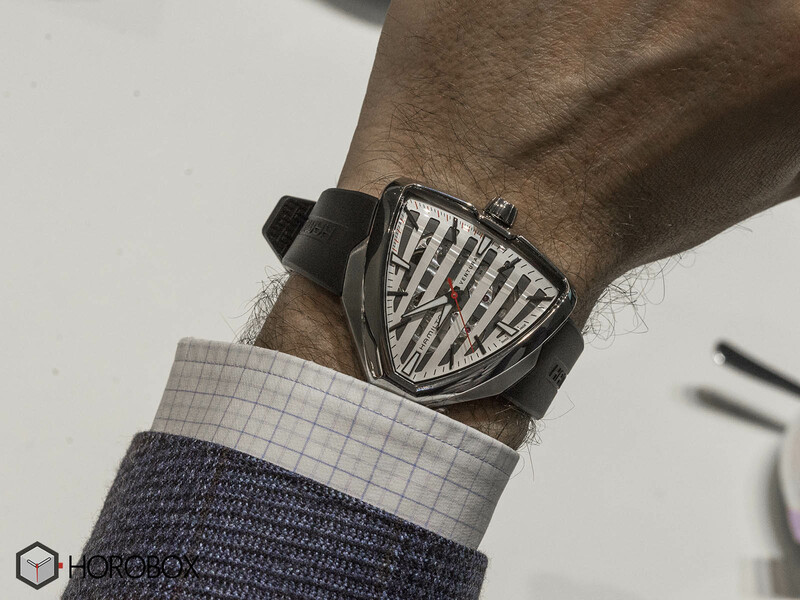 At the very center of the triangular dial, there is a symbol of resistance in physics which refers to the Ventura being the first electronic watch. The accents on the dial are in line with the case material. 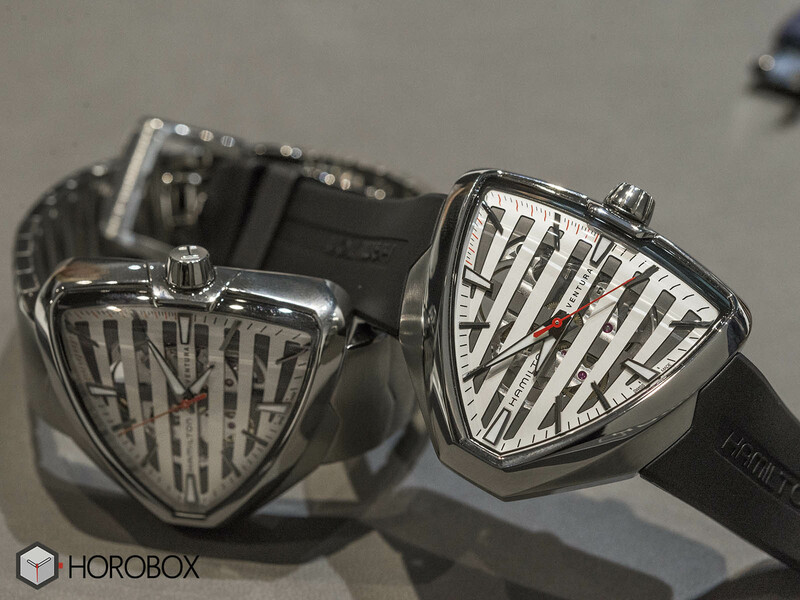 The quartz models of the collection are powered with the Caliber Ref. F05.11 which is supplied by another Swatch Group company ETA. 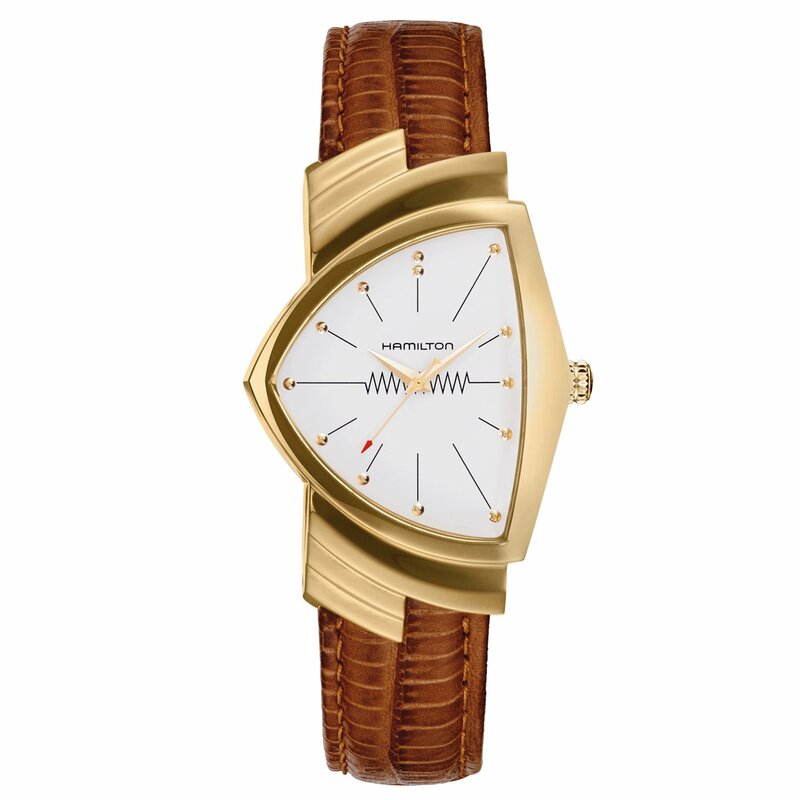 The movement that normally contains the date function is revised to no-date style for this model. 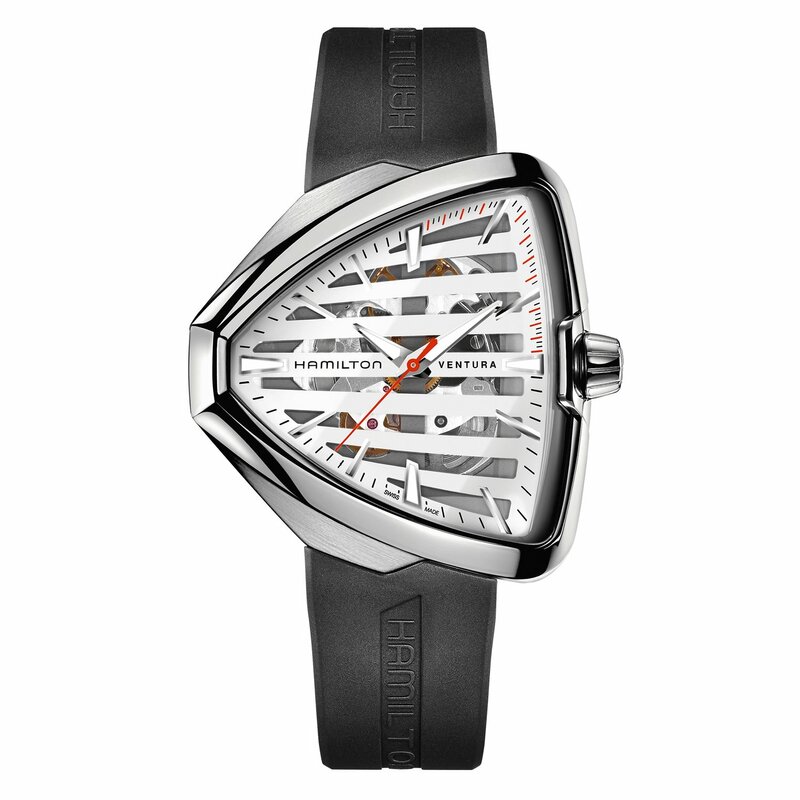 The third model in the new Ventura collection comes with automatic Caliber Ref. H-10 movement and in a skeleton form. 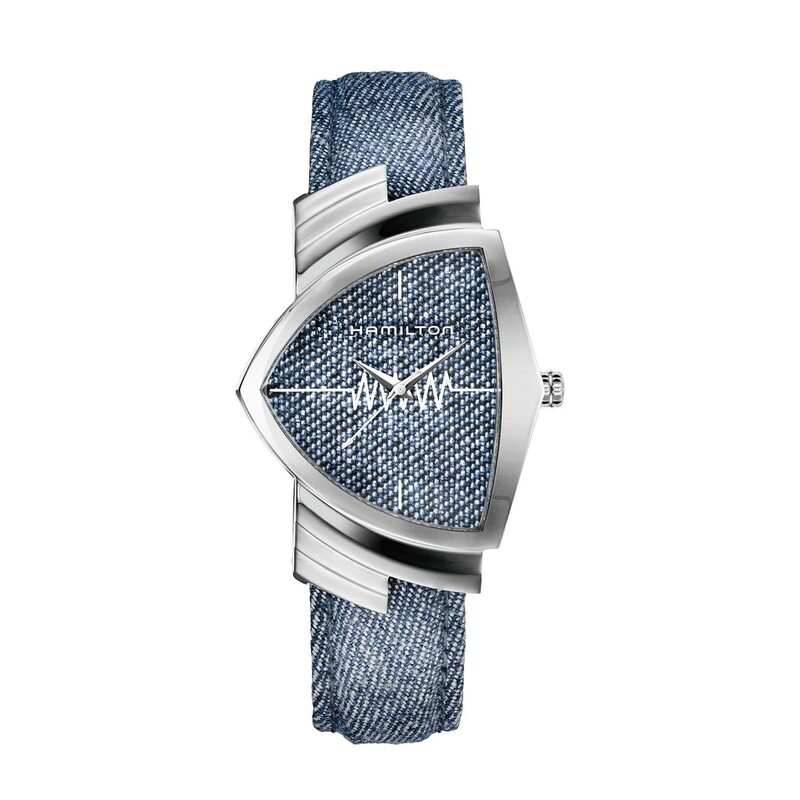 The new model is offered in a stainless steel case measuring 42.5mm x 44.6mm. Thanks to its self-winding movement and skeleton dial, the Ventura Skeletonized looks pretty masculine when compared to the rest of the collection. 3 different Ventura models are offered with cords from different materials. 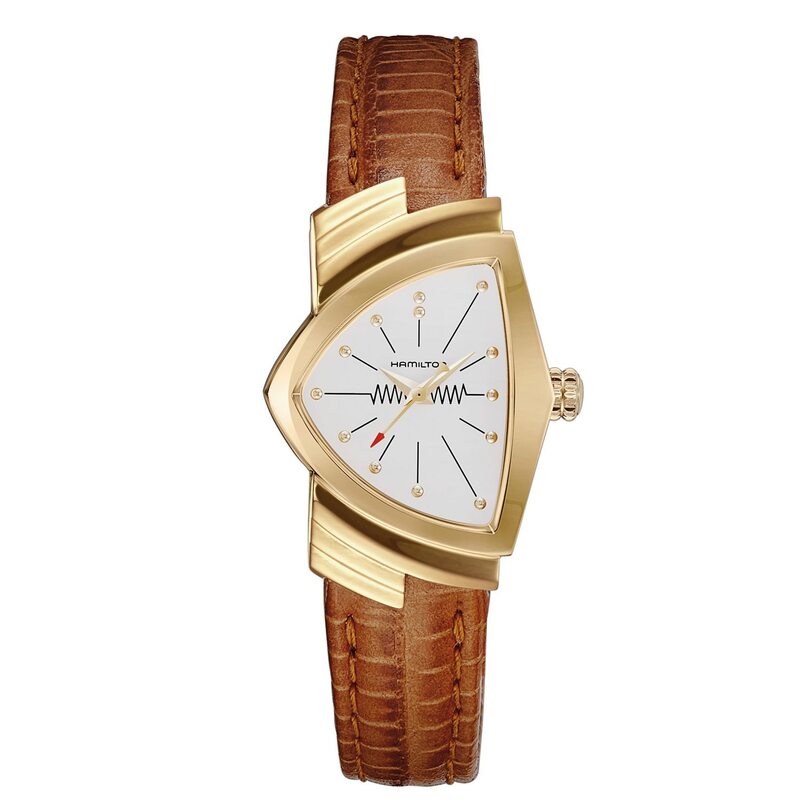 The white dial has a gold-plated brown lizard leather cord, a denim cord with a denim quadrant, and a semi-skeleton model with a rubber cord. Ventura models are offered in three different strap options with different materials. 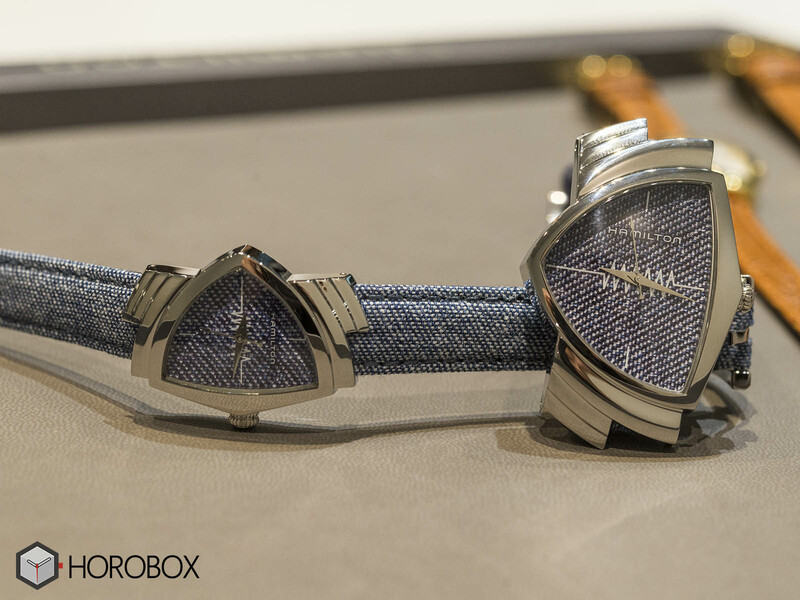 The white dial and gold plated version comes on a brown lizard strap, while the denim version comes on a matching denim strap. The skeleton model is offered on a black rubber strap. The new Hamilton Ventura line is offered in a price range of 875 to 1600, 00 CHF and will hit the stores in summer.